↑ Malayalam Actors Height – How Tall ওয়েব্যাক মেশিনে আর্কাইভকৃত ১৩ জানুয়ারি ২০১৪ তারিখে. Celebrity.psyphil.com. Retrieved on 15 August 2013. ↑ ক খ Irene Eapen (30 March 2009). "The Veteran Hero of Malayalam Industry". OneIndia Entertainment. ↑ ক খ Pain And Palliative Centre. Mammoottylive.com. 25 February 2007 Accessed 30 October 2007. ↑ Annual Report 2001. Pain and Palliative Care Society. painandpalliativecare.org . July 2007. Retrieved 30 October 2007. ↑ Relevance of the Pain and Palliative Care Society.. painandpalliativecare.org . October 2006 Accessed 30 October 2007. ↑ Padma Shri Awardees. India.gov.in. Retrieved on 10 July 2011. ↑ Malayalam Communications Board of Directors. Kairalitv.in. 1 November 2004. Retrieved 30 October 2007. ↑ Mammootty enlivens Akshaya network. The Hindu Businessline. 26 February 2006. Retrieved 30 October 2007. ↑ "I never wanted to use my uncle’s identity: Maqbool Salman". The Times of India. Retreieved 12 December 2012. ↑ "Mammooty introduced to films by MT Vasudevan Nair". mtvasudevannair.com. Retrieved 28 April 2011. ↑ "Mammootty completes his 300". Indiaglitz.com. Retrieved on 10 July 2011. ↑ "Mammootty Bio". Iloveindia.com (7 September 1953). Retrieved on 10 July 2011. 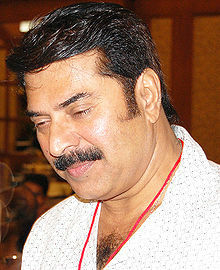 ↑ "Mammootty Biography". Movie.webindia123.com. Retrieved on 10 July 2011. ↑ "Mammootty Awards". Popcorn.oneindia.in. Retrieved on 10 July 2011. ↑ "Tribute to Pazhassi Raja". The Hindu. 19 January 2007. Retrieved 30 October 2007. ↑ Padma Shri Award recipients list. India.gov.in. Retrieved on 10 July 2011.